The term virtual organization is used to describe a network of independent firms that join together, often temporarily, to produce a service or product. Virtual organization is often associated with such terms as virtual office, virtual teams, and virtual leadership. The ultimate goal of the virtual organization is to provide innovative, high-quality products or services instantaneously in response to customer demands. The term virtual in this sense has its roots in the computer industry. When a computer appears to have more storage capacity than it really possesses it is referred to as virtual memory. Likewise, when an organization assembles resources from a variety of firms, a virtual organization seems to have more capabilities than it actually possesses. 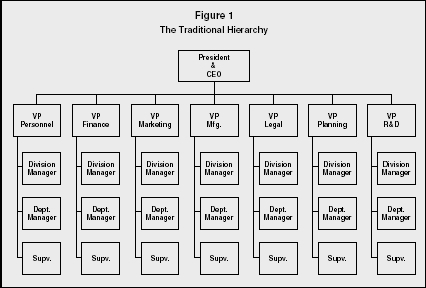 Traditional organizations integrated work vertically; that is, they delegated authority in a pyramidal, hierarchical structure. As the pyramid shape suggests, power was concentrated primarily among the handful of individuals at the top. This organizational form, shown in Figure 1, was first developed in the United States in the late 19th century with the advent of mass production. The prominent theorist of traditional hierarchical organizations was the renowned industrial engineer, Frederick Winslow Taylor. His book, Principles of Scientific Management, introduced the principles for designing and managing mass-production facilities such as Ford's automobile factory in Michigan and Carnegie's steel works in Pittsburgh. The hierarchical structure was designed to manage highly complex processes like automobile assembly where production could be broken down into a series of simple steps. Hierarchical corporations often controlled and managed all activities of a business from, the raw materials to their allocation to consumers. A centralized managerial hierarchy controlled the entire production process, with white-collar workers establishing rules and procedures to manage a blue-collar workforce. was seen as effective for managing large number of workers, but lacked agility and was unable to process information rapidly throughout the organization. Since the 1980s, many organizations have flattened their structures by shifting authority downward, giving employees increased autonomy and decision-making power. Advantages of flatter organization forms include a decreased need for supervisors and middle management, faster decision making, and the ability to process information faster because of the reduced number of layers in the organization. A consequence of flatter organizations, though, is that employees tend to be more dispersed both geographically and organizationally. Responding to this problem of dispersion, many organizations have eliminated superfluous processes and begun focusing on their core, value-added business. Flat organizations using joint ventures and strategic alliances are providing increased flexibility and innovation, and are replacing many traditional hierarchies. Ray Grenier and George Metes discuss the shift to this new organizational structure as a response to unprecedented customer expectations and alternatives, global competition, time compression, complexity, rapid change, and increased use of technology. 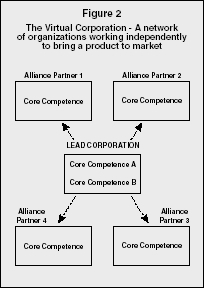 They describe the virtual model as a lead organization that creates alliances with groups and individuals from different organizations who possess the highest competencies to build a specific product or service in a short period of time (see Figure 2). Grenier and Meters further explain that these alliances are virtual because products and services are not produced in a single corporation whose purpose is longevity. Rather, these new virtual organizations consist of a hybrid of groups and individuals from different companies that might include customers, competitors, and suppliers who have a focused purpose of bringing a high-quality product or service to market as rapidly as possible. These alliances may be temporary with short concept-to-delivery cycles. William Davidow and Michael Malone, authors of The Virtual Corporation, claim that virtual corporations will be central to the new business revolution. Their concept of the virtual corporation brings diverse innovations together such as just-in-time supply, work teams, flexible manufacturing, reusable engineering, worker empowerment, organizational streamlining, computer-aided design, total quality, and mass customization into a coherent vision for the twentieth century corporation. The virtual corporation is more permeable than traditional organizational forms. Interfaces in a virtual organization between company, supplier, and customers continuously change, resulting in a blurring of traditional functions. Inside the office, work groups and job responsibilities may shift regularly. The virtual organization may not have a central office or an organizational chart. Suppliers, customers, and even competitors may spend time alongside one another in the virtual organization. Partners in virtual organizations share risks, costs, and rewards in pursuit of a global market. The common characteristics of these organizations include a purpose that is motivated by specific market opportunities, world-class core competence, information networks, interdependent relationships, and permeable boundaries. Virtual organizations represent structures that are motivated by specific market opportunities. Once the alliance has been formed and the opportunity has been exploited, partners may move on to new partnerships and alliances. Each partner in a virtual corporation contributes a world-class core competence, such as design, manufacturing, or marketing. This ability of multiple firms to create synergies among world-class functions and processes creates untold possibilities. As organizations create these new linkages, advanced information technology becomes an important element, and key to the success of a virtual organization. Computerized information systems allow employees from geographically dispersed locations to link up with one another. The virtual office may use desktop videoconferencing, collaborative software, and intranet systems to enhance the flow of information among team members. Besides the need for instantaneous communication with one another, members of these autonomous virtual teams have increasing requirements regarding the amount and quality of information they need to do their work. Members of the virtual organization, in turn, create a network of interdependent relationships. These relationships require firms to be much more dependent on one another than they have been in the past, demanding unprecedented levels of trust. Strong interdependencies cause organizations' boundaries to be blurred as competitors, suppliers, and customers enter into cooperative agreements. These new relationships among firms obligate organizations to use innovative management practices. Virtual teams are often the group structure used in virtual organizations. Jessica Lipnack and Jeffrey Stamps define virtual teams as "a group of people who interact through interdependent tasks guided by a common purpose." Unlike conventional teams, a virtual team performs work across space, time, and organizational boundaries connected by interactive communication technologies. Virtual teams may include employees, management, customers, suppliers, and government working together to achieve common goals. These teams often stay together only to perform its episodic task. They may work jointly on a new project, but when the product is designed and goes into production, the project is finished and the virtual team dissolves. Lipnack and Stamps offer three key features for a successful virtual team. One is the choice of team members with the appropriate skills and knowledge for the task; second is the definition of a purpose to steer the group; and third is the effective linking of team members, including communication channels, interactions, and relationships. Virtual team members are required to learn a new set of skills. One skill is the ability to interact with one another effectively despite infrequent or total lack of face-to-face contact. Another is the ability to assimilate quickly and effectively into new teams. Virtual team members should be technically adept to deal with the variety of required computer-based technologies. Additionally, virtual team members may need intercultural skills to work effectively in multi-national organizations. Greiner and Metes discuss the new leadership skills required to lead in the virtual environment, including the ability to manage a network of interdependent firms, to design virtual operations, to create and sustain virtual relationships with internal as well as external constituents, to support virtual teams, and to keep virtual teams focused. The leader of a virtual organization demands a new set of skills unlike the skills required in a traditional hierarchy. Another critical element to the success of the virtual organization is the ability of the organization to create world-class learning systems. These learning systems help leaders sustain or create world-class competencies. Effective learning systems can create pathways throughout the organization, in network fashion, enhancing the innovative capabilities of the organizational members. An organization's ability to sustain a leadership position in the world economy demands that organizations be on the cutting edge to develop rapid and elegant solutions to emerging consumer demands. An industry that is known for its use of partners and alliances is the entertainment industry, which has partnered with the computing, communications, consumer electronics, and publishing industries to convert movies, textbooks, and other software into digital formats. Increasing numbers of firms are moving to these new organizational forms. Corning, the glass and ceramics maker, is one such firm known for making partnerships work to their advantage. Corning has partnered with such firms as Siemens, Germany's electronics conglomeration, and Vitro, Mexico's largest glassmaker. Alliances are so important to Corning's business strategy that the corporation has defined itself as a network of organizations. Computer organizations that have successfully implemented forms of this new structure include Apple Computer and Sun Microsystems. When Apple Computer linked its easy-to-use software with Sony's manufacturing skills in miniaturization, Apple was able to get its product to market quickly and gain a market share in the notebook segment of the PC industry. Sun Microsystems has been considered another highly decentralized organization comprised of independently operating companies. Sun positions information systems as a top priority, trying to achieve faster and better communication. With numerous "SunTeams," members operate across time, space, and organizations to address critical business issues. Sun managers identify key customer issues and then form teams with the critical skills and knowledge needed to address the issue. This team might include sales people, marketing personnel, finance, and operations from various places around the globe; customers and suppliers may become episodic members as necessary. Weekly meetings may take place via conference calls. Critical to the team's success is the selection of talent from the organization, defining a clear purpose for the team's efforts, and establishing communication links among the team members. Sun has been working on further development of technologies such as EDI (Electronic Data Interchange) and RFID (Radio Frequency Identification technology). Both EDI and RFID will impact information exchange globally and across numerous industries. Virtual organizations can be very complex and problematic; they fail as often as they succeed. Among the many challenges of the virtual organization are strategic planning dilemmas, boundary blurring, a loss of control, and a need for new managerial skills. Strategic planning poses new challenges as virtual firms determine effective combinations of core competencies. Common vision among partners is quintessential to cooperating firms. Focused on a common goal, firms develop close interdependencies that may make it difficult to determine where one company ends and another begins. The boundary-blurring demands that these boundaries be managed effectively. Coordinating mechanisms are critical elements for supporting these loose collections of firms. Virtual structures create a loss of control over some operations. This loss of control requires communication, coordination, and trust among the various partners, as well as a new set of managerial skills. Employees are exposed to increased ambiguity about organizational membership, job roles and responsibilities, career paths, and superior-subordinate relationships. This ambiguity requires management to rethink rewards, benefits, employee development, staffing and other employee-related issues. Developing leaders who are able to create and sustain these organizational forms is critical. Les Pang offers a list of best practices, based on a review of successful implementations of virtual organizations. Foster cooperation, trust and empowerment. Ensure each partner contributes and identifiable strength or asset. Ensure skills and competencies are complementary, not overlapping. Ensure contractual agreements are clear and specific on roles and deliverables. If possible, do not replace face-to-face interaction entirely. Provide training that is critical to team success. Recognize that it takes time to develop the team. Ensure that technology is compatible and reliable. Provide technical assistance that is competent and available. The business environment will no doubt require firms to become even more flexible, more agile, and to bring products and services to market at an increasing rapid pace. Traditional organization forms are no longer capable of sustaining the needs of this relentless pace. New forms of organizing, such as the virtual organization, hold promise as organizational leaders experiment and learn new strategies for managing in the twenty-first century and beyond. These new structures, however, will require managers and leaders to face exciting challenges as they move into an environment of increased uncertainty and volatility. Camarinha-Matos, L., H. Afsarmanesh, and M. Ollus, eds. Virtual Organizations: Systems and Practices. New York, NY: Springer, 2005. Davidow, W.H., and M.S. Malone. The Virtual Corporation: Structuring and Revitalizing the Corporation for the 21st Century. New York, NY: Harper Collins Publishers, 1992. Greiner, R., and G. Metes. Going Virtual: Moving Your Organization into the 21st Century. Upper Saddle River, New Jersey: Prentice Hall, Inc., 1995. Hilty, L.M., E.K. Seifert, and R. Treibert, eds. Information Systems for Sustainable Development. Hershey, PA: Idea Group Publishing, 2005. Kirkman, B.L., B. Rosen, P.E. Tesluk, and C.B. Gibson. "The Impact of Team Empowerment on Virtual Team Performance: The Moderating Role of Face-to-Face Interaction." Academy of Management Journal 47, no. 2 (April 2004): 175–192. Levary, R.R., and R. Mathieu. "Supply Chain's Emerging Trends." Industrial Management 46, no. 4 (July/August 2004): 22–27. Lipnack, J., and J. Stamps. Virtual Teams: Reaching Across Space, Time and Organizations with Technology. New York, NY: John Wiley and Sons, 1997. Pang, Les. "Understanding Virtual Organizations." Information Systems Control Journal 6 (2001): 42–47. Taylor, F.W. The Principles of Scientific Management. New York, NY: Harper, 1911. Vakola, M., and I.E. Wilson. "The Challenge of Virtual Organization: Critical Success Factors in Dealing with Constant Change." Team Performance Management 10, no. 5-6 (2004): 112–120.